Payroll Solution from Cogxim is a front edge software to manage overall payroll processes and operations uncomplicatedly. The solution is a complete package to handle all payroll activities starting from capturing the employee details to generate accurate pay slips considering all deductions and leaves. This robust solution enhances the performance at reduced costs. The solution helps in smooth payroll processing by reducing errors and frauds with highly protected software. The module incorporates powerful and responsive interface for hassle free functioning of each module. 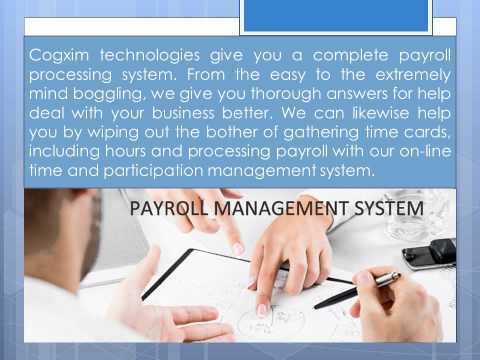 Cogxim Technologies provides you with a complete payroll processing system. From the simple to the very complex, we provide you with comprehensive solutions to help manage your business better. Q. How to start with Cogxim? We worked out a simple start procedure to make it easier for you to begin working with Cogxim. Just contact us and give your project an immediate and successful start! Q. What is a dedicated development team? Q. I would like to see Cogxim previous projects?